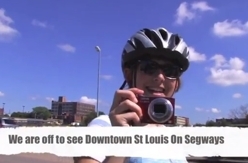 Join us for a fun and exciting tour of Historic Downtown St. Louis, or the “Crown Jewel” of St. Louis - Forest Park, or the Soulard/Lafayette Square Neighborhoods riding Segway’s® newest Personal Transporter, the i2. 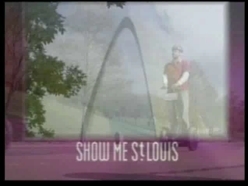 Before your tour begins, Glide St. Louis Tours will train you to safely operate and ride the Segway® PT. Your “Tour Glides” will then "glide" you on a narrated journey to your tour's many sights atop these fun high tech machines. Chances are that you may find yourself becoming one of St. Louis’ newest “sights” as people stop to watch you glide by on your Segway! 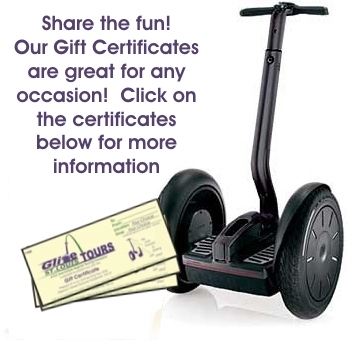 Segways are a great way to tour St. Louis as you can accomplish much more sightseeing in less time than walking tours. And, unlike bus tours, you can still get close enough to be part of the scenery! Get up close and personal on the St. Louis City tour with such attractions as The Gateway Arch, the St. Louis Cardinals' Busch Stadium, the Eads Bridge, the Old Court House, Union Station and more. The Forest Park tour will have you visiting The Grand Basin, The Art Museum, The Jewel Box, The Planetarium, and more. In the Soulard/Lafayette Square neighborhoods you'll visit the Soulard Market, Lafayette Square Park, the Busch Brewery, cultural & religious landmarks and more. Tour sizes are kept small and participants receive one-on-one training so that he or she can fully enjoy the experience. Throughout the tour, you will learn many historical and interesting facts about St. Louis during the stops you make. There will be a number of planned photo opportunities; however you are encouraged to request other stops along the way! From "16 to 116 years old", practically anyone can learn to ride these awesome, self-balancing machines. For our D/deaf and hard of hearing gliders, sign language interpreted tours are available at no additional cost. Inquire when booking. 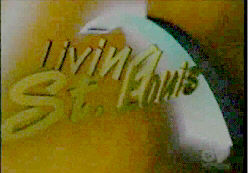 Now in our 8th Season!! The Downtown St Louis Tour in action! "This is way better than cool!" - Jason S.